Over the last few years Python has changed substantially, introducing a variety of new language syntax and libraries. While certain features have received more of the limelight (e.g., asynchronous I/O), an easily overlooked aspect of Python is its revamped handling of file names and directories. 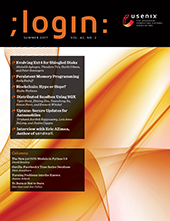 I introduced some of this when I wrote about the pathlib module in ;login: back in October 2014. Since writing that, however, I’ve been unable to bring myself to use this new feature of the library. It was simply too different, and it didn’t play nicely with others. Apparently, I wasn’t alone in finding it strange--pathlib was almost removed from the standard library before being rescued in Python 3.6. Given that three years have passed, maybe it’s time to revisit the topic of file and directory handling.